Monday marked the Norwegian parliamentary election. Prime Minister Jens Stoltenberg attempted to defend his reign as leader of the country against the ever-more popular Conservative party and it's leader, Erna Solberg (and a handful of other parties) although ultimately failing making Solberg Norway's second female Prime Minister. As expats in the country, we hardly noticed election happenings. Of course, ad campaigns were evident but obviously, never in English. A few flyers made their way into our mailboxes and funny enough, alcohol was banned from being purchased in the shops on election day but that was the extent of the direct impact on us. As we awaited the results Monday evening, I realized the stark contrast between our experiences of elections abroad as expatriates. While in Gabon, we witnessed one national election. For weeks in advance of voting, we were aware of what was taking place. Cars with loudspeakers drove through town with someone sitting in the front, passenger seat spouting propaganda and platforms loudly through the streets. We'd see ad campaigns albeit quite different than those in developed nations. All media is government controlled and with the majority of local population living in poverty, advertisements on TV and the Internet were not the main form of communication. The year before we arrived in our equatorial home, national elections sparked intense rioting in Port Gentil. Infamously referred to as 'The Problems' by expats and locals, when Mr Bongo claimed a win continuing to keep his family in power since 1969, the opposition, based in Port Gentil, violently objected. They believed the election was rigged and many pointed fingers at France, their former colonial power, and its oil company, Total. The French Consulate was set ablaze and the Total Compound, residence and offices for it's foreign workers, was attacked. What did this mean for expats? Well, many families were evacuated via boat to Libreville. Others were evacuated from their homes to larger boats who then dropped anchor in the ocean well away from the riots and any civilization. Smaller companies, ours included, moved their expats to the Port which was then blocked off by the French army. When order was restored a few days later and things calmed down, life in Gabon returned to normal for locals and expats alike but the damage would be evident for years to come. When the elections came around while we were residents, precautions started early. Our companies would send out bulletins with the latest news and forecasts. We'd be advised as to their emergency evacuation plans and told to limit our mobility for the days leading up to and after the elections. We'd stock up on food, water and gas in the event that we became trapped inside and we'd hope for the best. This was one of those times where being an expat was scary. The uncertainty led to fear and anxiousness as we've seen so often lately, it doesn't take much for things to turn quite violent. Thankfully, the elections that we were present for remained peaceful and calm and our preparations and worry turned out to be unnecessary. When I came across the first headline on Monday, I realized how oblivious I had been in terms of the entire Norwegian election. I knew it was coming and while I generally keep up to date with current events, I hadn't done so this time around. Abashed at my lack of awareness, it became apparent that the Norwegian election seemed to align with the plethora of stark contrasts between our two expatriations. More information about the result of Norway's election can be found here and fellow blogger, David, wrote a great post with some election details and opinions found here. 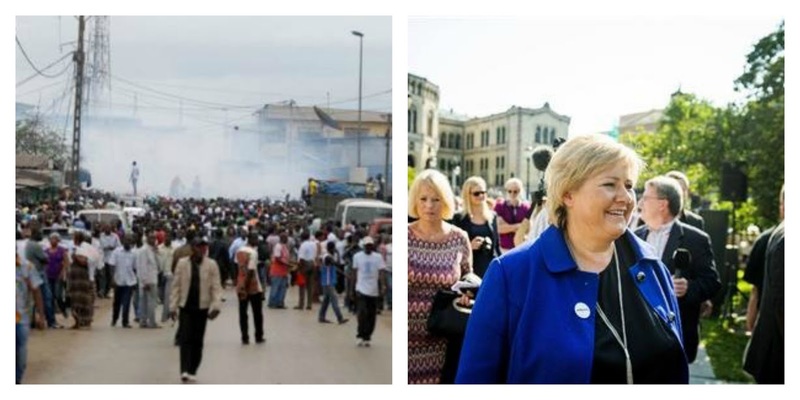 You can also read about the 2009 elections in Gabon and the subsequent riots here and here. What a fascinating contrast of experiences. Though I'm sorry you had to live those scary few days in Gabon, it sounds like you really gained some valuable insight out of it. Oh there were plenty of scary times in Gabon but I credit them to helping us have such a positive second expatriation and certainly made us thankful for growing up in a stable, safe, developed country! Definitely an interesting thing to experience. While I don't think I'd ever want to experience elections in a developing country, I do think it is interesting, the different methods of campaigning that have to be used in order to reach people. So, so interesting. Elections in Malta are about as different from Canadian elections as you can get. Here they have a two-party system (Labour [liberal] and National [conservative]) and there are strong political lines that divide the country geographically and culturally. In the past there has been some political violence in Malta, so every time an election comes and the outcome is uncertain, people become wary. But last year's went off without any problems - just the usual hooliganism. During the election, like in Gabon, people drive around blaring electro-dance music and political party songs and chants. There are posters and billboards and ads on the tv and radio - only a few in English. It's all the local news outlets cover. After the electrion results are announced the country erupts in intense celebrations - drinking openly in the streets, driving around and honking, impromptu parades complete with floats and more electro-music. It's insane! WOW what a stark contrast!!! I think getting to experience how the politics work in our adopted countries is one of the most interesting things about being an expat (I was glued t my tv during France's election last year) but I cannot imagine how terrifying it must have been in Gabon, not knowing if things would set off at any second. What an even to have experienced! Very interesting Jay. I like that you wrote about an issue that we (and by "we" I mean Westerners) take for granted and that you highlighted the deep contrasts that exist in relation to a mechanism of rights and citizenship that should be fluid, transparent and inclusive, but often isn't. It seems like the elections in Gabon mirror those in many other developing countries (for me Egypt, South Sudan, Rwanda, Burundi and Libya come to mind). What's important as an expat is to have a company/organization/embassy that looks out for you and is very much "in the know" (which you'd expect to be the norm, but isn't always the case) along with a good network of people you can count on, both expats AND locals. After experiencing the aftermath/fallout of the Egyptian uprising, I have to admit the latter was more handy in the long run than the former. Anyhow, it sounds like you two were well taken care of, which is great! A good indication for future postings with the same company. you REALLY should write a book - could you have had two more opposing experiences? politically, socially, and economically these countries might as well not be on the same planet!